Imagine for a moment, the impact on your next event or message if you had up to 40 out-of-home advertising locations working for you. Better results? You bet! You can now book one of our splash campaign packages for 2019! Short term blitzes are our specialty and we want to be part of your next promotion. Secure 20, 30 or even 40 OOH locations for 30 days to help spread the word. Last minute deadline, not a problem with flights going live in as quickly as 3 days. Learn more below or call us for more information today. What 40 OOH locations can do for you. Locations average 30K+/- impressions per day. 40 locations would bring you an amazing 1.2 million impressions per day. Best ROI: OOH can deliver your message to drivers and pedestrians with unmatched value and ease. With one call you can secure your events campaign on our calendar. For additional information and to answer any questions you may have please contact us. When putting your advertising campaign together, it’s best to consider your outdoor advertising options and their pros and cons. According to Ad Age, OOH advertising is the only form of traditional media to get a bump in terms of sales. In 2015, outdoor advertising grew from $7 billion to $7.3 billion. Outdoor advertising has a huge audience – bus bench advertising in cities like Los Angeles, for instance, can command an audience of 35,000 to 50,000 people per day. Omaha bus bench locations’ traffic counts average 30,000+/- per day. Bus benches give your campaign high-impact graphics and visuals to help take your message further, just as billboards do – they also target passengers, drivers, and pedestrians. Omaha bus benches do this at a fraction of the cost of billboard advertising – when you compare the cost of bus bench advertising and billboard advertising it’s amazing. Bus benches deliver your message in a targeted area of your choice and provide effective coverage where traditional billboards or other out-of-home advertising may be limited. There are a handful of ways bus bench advertising differs from billboard advertising; let’s discuss a few. First, bus bench ads can go from concept to “on the street” in as few as 24 hours. This gives you the power to say what you want to say when you want to say it quickly. Second, bus benches are located at street level, making them ideal advertising mediums and easily viewable to both drivers and pedestrians. Third, bus bench ads can provide big, impactful coverage in specific geographic areas where traditional billboards are non-existent or restricted. Subsequently, geographic targeting can be used as the basis for targeting business to business or consumer demographics. We’re in a very mobile world and research shows that consumers are traveling farther than before, so it is wise to consider expanding your advertising to match their movement. Bus bench ads are typically priced the same across all markets but vary depending on the location of the bench and length of the advertising contract. Whereas billboards can range from a few hundred dollars per month to many thousands a month, depending on their size, location, traffic volume, and length of your campaign. The best way to compare cost-effectiveness between bus bench ads and billboards is by Cost Per (1,000) Impression – CPM. Bus bench advertising has an average CPM of $0.07, compared to the average $2.50 CPM of billboards. That’s up to 35 times less expensive for the same (1,000) impressions. So, you can save that money or advertise at multiple locations to maximize the impact of your campaign and gain more impressions. Bus bench advertising can piggy-back other out-of-home advertising options, like sport complex advertising, bus wraps, and billboards to create complimentary parts to your campaign – or used as a solo media platform. Whatever your advertising budget, bus bench ads will give you more Return on Investment (ROI) while providing great market coverage. In our fast-paced world, bus bench advertising is easily the most cost-effective way to deliver effective outdoor advertising for pennies on the dollar. 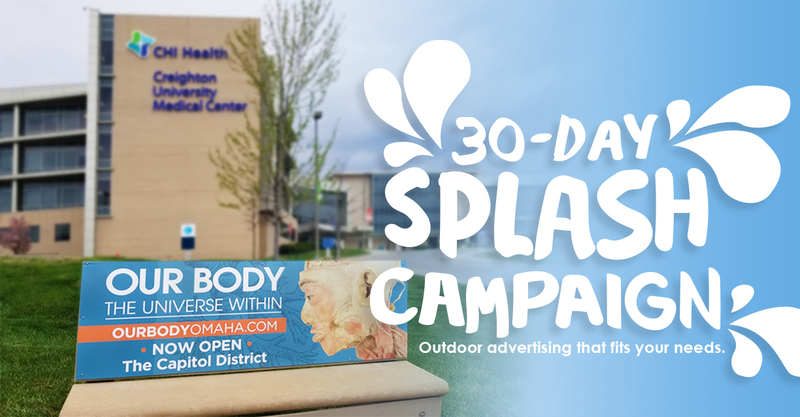 With locations all across Omaha, the Omaha Bus Bench Program is outdoor that fits your needs. Watch for our next post for more ideas about piggy-backing outdoor advertising campaigns.